Canon announced the EOS-6D Mark II camera on June 29, 2017. It is in stock at most camera stores now. The original EOS-6D was intended as entry level full frame camera for those who cannot affordable the higher end models. The Mark II is no different except it has a few more bells and whistles. Those who expect too much from it will be disappointed. Those who are realistic and want a good value performer will be pleasantly surprised. DPReview did an extensive review of the EOS-6D Mark II and came up with a balanced view of the camera and I am in agreement with their findings. Below is an excerpt from Canon Digital Learning Center on why the EOS-6D Mark II can be very helpful in taking HD videos, like in a wedding or family get together. The new full-frame Canon EOS 6D Mark II is really a great platform for single-person video operation — whether video is a big part of what you do, or something you’d like to add to your still-image shooting. Many of the virtues this camera delivers to the still-image shooter are equally appealing for recording HD video, as we’ll discuss in a few moments. This camera records Full HD video (1080p, or 1920 x 1080 pixel resolution). The only 4K capability is an option to generate in-camera Time Lapse Movies, which it can render as 4K files. Full HD and HD (720p) video is recorded using the entire horizontal width of the full-frame sensor. While 16:9 aspect ratio for Full HD or HD defines that some of the top and bottom of the traditional 3:2 sensor be cropped, you do get the full width of the full-frame sensor. Exposure modes available for video recording are full manual exposure (M on the Mode Dial), or totally automatic Program exposure if the dial is set anywhere else. Unlike some higher-end EOS models, there is no true Shutter or Aperture Priority operation during video recording. Full-frame is a great platform for DSLR video, especially since it completely opens the door to wide-angle and ultra wide-angle lens options. As mentioned above, when recording Full HD and HD video, you lose nothing from the full horizontal width of the full-frame image sensor. This means that lenses like a 16–35mm, a 14mm f/2.8L II, or the incredible EF 11-24mm f/4L lens, deliver the same ultra-wide character for video that they do for stills. And, it means excellent low-light sensitivity, with less digital noise at higher ISO settings. EOS 6D Mark II is a very effective camera for available-light shooting. Parenthetically, the standard range of ISOs for video recording runs from 100 thru 25,600. This feature alone is arguably enough to make this a spectacular choice for single-operator video recording. Canon’s Dual Pixel CMOS AF technology has taken what has been the single biggest obstacle to good video recording, and transformed it into a profound strength. AF speed deliberately slows down when switching from Live View (still images) to video recording, to give AF with smooth transitions as focus is racked from near to far. In other words, AF is specifically tuned to the common demands of video. Tracking Sensitivity (when there’s a sudden change in what camera is following, will it immediately try to re-focus on obstacle or new subject, or alternatively wait and try to hold focus on original subject?). Turning Movie Servo AF off in the menu returns the camera to One-Shot AF operation, for locking focus on stationary subjects. Face Detect AF, which sounds like an amateur-based feature, actually is superb for many video situations where recording human subjects — from interviews and reality-type recording to sports and action. Combined with the responsiveness of Dual Pixel CMOS AF, you’ll likely see far less focus “drift” if and when subjects move slightly, compared to earlier AF systems. A huge EOS 6D Mark II feature for video. Simply touch the screen to change where the camera focuses (even during live recording), and likewise tap the Q-icon onscreen, and make changes to multiple camera settings on the Quick Control Menu — again, all via touching the screen. It’s quick and silent. Canon’s stepping-motor (STM) lens technology provides a focus drive that’s especially suited to the needs of video. While several EF-S lenses (exclusively for cameras with the smaller, APS-C size image sensors) are now available with STM focus technology, the EF 24–105mm f/3.5–5.6 IS STM is a lens for full-frame cameras which delivers similar benefits. The focus is superbly smooth and responsive, without the jittery response some other lenses may deliver. It combines beautifully with the camera’s Dual Pixel CMOS AF system, and is worthy of consideration as a “normal” zoom lens if you plan on recording lots of video, and don’t need extremely wide apertures for shooting in very low light levels. Few things are as distracting to viewers than shaky video, but many shooters want or even need to hand-hold their camera. Built-in Movie Digital IS provides an added measure of stabilization, and is especially effective when walking, jogging, or working from a moving vehicle to follow a subject. It combines with any optical Image Stabilization in Canon EF lenses to really make a difference in steadiness. Since this is digital stabilization, the video imagery is slightly cropped when Movie Digital IS is active, but the LCD monitor continues to show you an accurate view of what your finished video will include. Another huge asset for single-person video recording. The monitor doesn’t just tilt. Instead, it swivels and rotates, making it easy to find the right position to clearly view your scene — especially at high and low angles. And, if you ever want or need to record vertical video, you’ll find this LCD monitor works well there, too. And remember: this is a touchscreen monitor, with outstanding shooting control during video by simply touching the screen. It even works for menu selections. Full HD remains the most popular video size for online content, and the 6D Mark II provides the option to shoot it at up to 60p (59.94 fps), which gives a very smooth rendering of any subject or even camera movement in a scene. At Full HD (1080p), users also have a choice of 30p (29.97 fps) and 24p (23.98 actual fps), as well as 50.00 and 25.00 fps if the video operation has been set for the PAL system, commonly used overseas. Video can also be recorded at 720p, or “HD” resolution. Both 1080p and 720p provide compression options of IPB (relatively compact file sizes) and IPB Light (extremely compact file sizes, less than half the size of a typical IPB file). Achieve High Dynamic Range video results, right in-camera, with no post-processing required. The camera shoots a Full HD video, at 60 fps, recording every other frame with about 2 stops deliberate under-exposure (nothing for the user to set…this is all done when the Mode Dial is set to “SCN” position when recording video). Then, the camera processes this recording into a finished file, with the darker frames minimizing highlight brightness. The finished video is in Full HD size, at 30 frames per second. Create a time lapse video, again right in-camera. There’s no need to stitch individual still images into a finished video, using computer software. You define in the red shooting menu the interval between frames (anywhere from one second to nearly 100 hours! ), and the number of total frames you want to capture. The 6D Mark II displays both the time it’ll require to shoot this video at these settings, and how long a finished video will play for at normal playback speeds. Especially noteworthy is the menu option for the Time Lapse Movie file to be rendered in 4K size, or Full HD. To be 100% clear, this is the only instance where the EOS 6D Mark II can deliver a 4K-size video file; any video other than Time Lapse Movie cannot exceed 1920 x 1080 in pixel resolution. 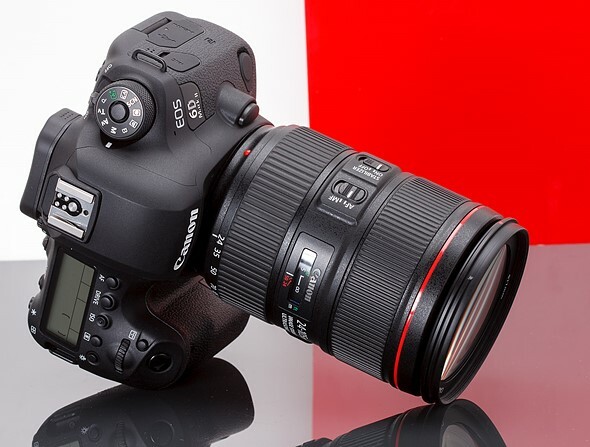 EOS 6D Mark II offers several possible options for video recording, where you may want or need to set the camera up on a tripod (or other stable platform), and remotely start and stop video recording. Either the traditional wired remote control RC-80N3, or the Timer Remote Controller TC-80N3, can plug into the camera’s remote control socket, and be used to start and stop video recording. One important caveat for this — you must go into the red shooting menu, with the camera set for video, and change the default shutter button operation for video to enable video start/stop at the shutter button. With that set, the remote control socket can now start and stop video recording. This tiny optional remote controller, when set to its 2-second delay setting, can instantly start and stop video recording. The only disadvantage is that it needs to be positioned more or less in front of the camera to have its signals hit the camera’s IR sensor, on the front of the body. Be aware that for technical reasons, if using this or any previous compact Canon infrared remote controller, the 6D Mark II’s built-in Bluetooth must be turned OFF. Leveraging the EOS 6D Mark II’s built-in Wi-Fi® technology, this Bluetooth-enabled, optional accessory allows the camera to be remotely fired from distances up to about 50 feet (15m), and from any direction, not just facing the front of the camera. Like the infrared remotes, the BL-E1 can control the camera from distances up to about 16.5 feet away (roughly 5m). On compatible iOS and Android devices, install the free Canon Camera Connect app, pair it with the EOS 6D Mark II, and use your smartphone or other device as a wireless remote controller for video. The beauty of this is that it works up to about 50 feet (15m) from the camera, and if you already own a compatible phone or tablet, there’s no additional cost — the Canon Camera Connect app for iOS and Android is free. The EOS 6D Mark II continues to bring tremendous value to Canon customers, and its new video features underscore that. It offers great “bang for the buck” to both still image and video shooters, largely because of its full-frame image quality, and the features and performance included with it. For video users, this will be a very compelling camera for single-operator video recording. We repeat: The combination of full-frame image sensor, the wide-angle lens opportunities that opens up, the low-light performance, and the superb Dual Pixel CMOS AF, along with the fully articulated, touchscreen LCD monitor, creates a very potent multi-media tool for still and particularly video shooting. The EOS 6D Mark II is a great entry into effective video recording with a full-frame camera, especially for single-person operators, who may need to take advantage of the camera’s relatively light weight, excellent responsiveness and focus performance, and Full HD video quality. Whether you’re primarily a stills or video user — or both — think about how the EOS 6D Mark II can expand your visual potential.